Hey you got your Soulive in my Beatles. And you got your Beatles in my Soulive. To go along with my series of all covers modcasts it is fortunate for me that one of my favorite jazz acts is now touring a new forthcoming Beatles tribute album, Rubber Soulive. It's a great mix of familiar songs, and familiar sounds. I've been a fan of Soulive since first the moment I discovered their debut EP Get Down at a Tower Records (RIP) listening station away back in the last millenium. I was instantly captivated by their hammond backed sound, and the obvious influence on the trio of Jimmy Smith among others. But, it was also refreshing to hear an act that wasn't afraid to embrace both classic and modern styles as they incorporated funk, soul, and lots of hip-hop into their jazz. Such is not the case with Rubber Soulive, the band's 9th album -- that is, there's no hip-hop to be heard here. No, this is different because it's a tribute in every sense of the word. 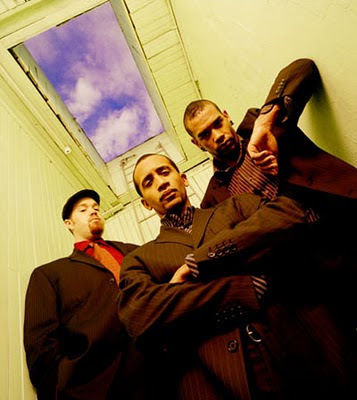 For me, Soulive was impressive from the get-go for their originality, and for their original compositions. There are hardly any cover songs on their other albums -- although they do a lot of really cool covers in their live shows (which sadly I haven't seen in about five years). They burst onto the scene in the late '90s with fresh new material, and they've continued to produce new original songs ever since. So, it was a bit surprising to see them tackle something like this Beatles tribute. Rubber Soulive is tight, as only a Soulive record could be. The band has never been one to go completely wild when they jam. There's always been a little sense of self-restraint lurking just beneath a suave, smokey surface, like on 2001's Doin' Something -- an album that practically swaggers when played. Even at their funkiest, with soulful vocals like those on 2009's "Up Here", there's an overall sense of the band being firmly in control. That control is front and center on Rubber Soulive. From the start songs are reverential, almost like individual moments of Beatles worship. "Eleanor Rigby" has a gospel like processional feel to it that I don't think I've ever heard the likes of in a Beatles song before (or likely will ever again). The album progresses smoothly to a more jazzy feel, and along the way "I Want You (She's So Heavy)" gets a most bluesy treatment complete with mournful guitar and swirling organ. By the time you get to "Revolution" and "Day Tripper", the funk is in full force. And the hammond B3 is leading the whole parade when it all wraps up with the most triumphant version of "While My Guitar Gently Weeps" that I've ever heard, again thanks to dominance of the organ. Lots of people don't like Beatles tribute albums, or jazz covers of Beatles songs. I am not one of those people. While this album is in some ways a departure for a Soulive production, it is also in keeping with the reverence with which the band approaches their music. Modcast #169: It Must Be Summer!